First, let me start by saying that I’m a League of Legends (LoL) fangirl. I tell you this because when I say Smite might motivate me to leave LoL, it should have impact. Smite has all the things I like about LoL, but takes care of a few of the things I don’t; including the excessive number of trolls and flamers that Riot bans people for reporting. More on that another time. 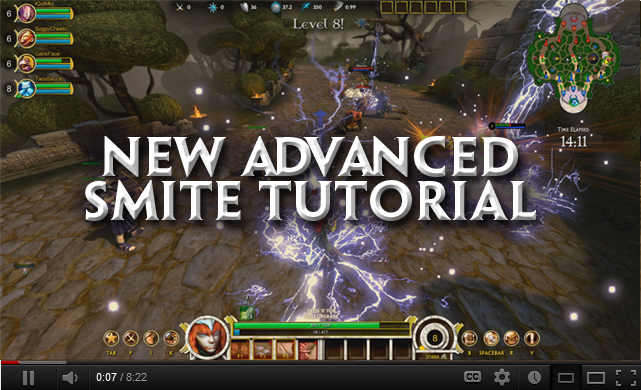 For now, let’s talk Smite! I’ve always been interested in mythology; no secret there. I have written before about Joseph Campbell and his words of wisdom, not the least of which include the hero’s journey and the universality of myths as truths. Smite uses gods from a variety of mythologies (e.g., Greek, Hindu, Chinese, Egyptian, etc.) and turns them into mages and melee fighters. In teams of 5v5, you set off down the three lanes, all full of towers and minions (and yes, there are jungles too) all leading to your goal; the Minotaur. 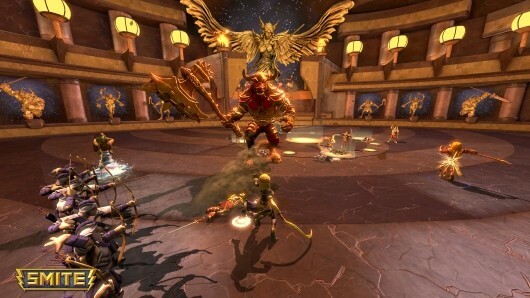 Take down the fierce golden Minotaur, and you claim victory for your team. Simple as that… in theory. The view is third person, so it feels more like World of Warcraft than LoL in that respect. Movement is very familiar if you play WoW as well: WASD for running, number keys for abilities, and the mouse guiding your direction of travel. Like with LoL, you use favor (aka IP) or gems (the in-game currency that has to be purchased with actual money) to unlock gods and a variety of skins. There are some gods who excel at defense, some at magic use, and some at melee fighting; as in most any MOBA. And, of course, you can purchase a wide variety of items to passively buff any number of stats on each character. One of the great things about Smite (at least as compared to LoL) is the ability to have your items and abilities auto leveled for you. This means those who are consumed with trying NOT to nerf their team can focus on other things. As you’re entering the game, you simply unmark the boxes for either or both when you’re ready to customize your toon. Since I’m sure you’re well versed in MOBAs by now, I’ll talk about particulars only briefly. The graphics for this game are phenomenal. The detail to the characters both in character select, in the animations for the skins, and in game play is breathtaking. The sounds for the game aren’t spectacular, but they’re not overwhelming either. The characters have their taunts and musings, and the voices are well done, but they are by no means meant to make or break the game. Something auditory, however, that I did find amusing/helpful was a verbal cue for team notifications. In other words, when someone is trying to warn you that the right lane that you’re trying to push is about to be ganked, a voice says, “Right lane under attack!” and whether you look at the map or read the chat log, you know what’s coming. To be honest, I prefer that to a “PING” any day. Especially when people are spamming the ping… but I digress. In my opinion, the significant advantage this game has over LoL is the immersion. Because this game is done in third person point of view, the game is far more transportational than LoL is. There is no overhead view; you are IN the battlefield. This, of course, makes map awareness vital, but allies and opponents are labeled well from the third person view as well, so as long as they’re visible, you can easily weave your way through the jungles and lanes. Team fights are also facilitated well by the ease of map awareness and the point of view change. Another bonus (or frustration depending on how you play) is the immersion in fights. As a ranged character, every ability is a skill shot; you HAVE to aim your shots and be in range. However, you’re given an arrow to line your shots up with (making my life SO much easier). As a melee character, you can also see where your ability is going to hit (you can walk around with your ability range lit before you take the shot… VERY handy), but when you’re auto attacking, you have to stay oriented; much harder to do when you aren’t look on from above. From a psychological perspective, the social aspect of the game is definitely present; there are chat tabs that you’re constantly exposed to in the lobby (much like you are with WoW), and this is where you friend chats pop up as well. Anyone who has managed tabs on a web browser, can manage these. Though the game is in closed beta, current players have been given invitations to send to friends, and you can always request a game key directly from Hi-Rez (mine took only a few hours to arrive). Either way, the ability to play with friends is definitely a motivator for some to play this game. If your friends aren’t on the game (or you want to get REALLY good before you invite them… ahem…), there is still the team play socialization that facilitates cooperation, planning, leadership, and social adeptness. This game has levels, favor, and types of game play which become available only after reaching certain levels as a player; all of these become reinforcers and promote achievement based game play motivation. The increased immersion, thanks to the third person view, makes escapism and transportation easier and more fulfilling.